Even though he started out with good intentions, Benton Harbor, MI police officer Andrew Collins soon learned that it was easier to make arrests of people he "knew" were drug dealers if he didn't exactly follow protocol. Young Jameel McGee, anxious to be a good father to his son and start a new business, trusted the wrong people. When the lives of these two men collided, it set both of them onto a long path of trouble, anger and eventual forgiveness and healing. 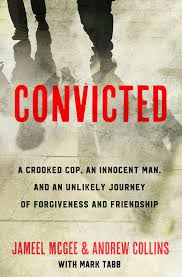 They alternate chapters in telling their respective stories in the book Convicted. Andrew Collins liked the fact that he was able to secure more arrests and convictions of drug dealers than any other cop on the force. At the same time, he grew frustrated when he saw people released on technicalities. Prosecutors asked him questions about the circumstances of arrests he made in such a way that he knew the answers they wanted to hear (even if the answers weren't truthful). He soon began to bend the rules in all sorts of ways in order to secure convictions or pad his meager (as he saw it) salary: keeping a stash of drugs to plant on suspects, pocketing money that was earmarked to pay informants, lying under oath during trials, etc. He justified his actions by saying he was keeping drugs and bad people off the streets. Jameel McGee was a man who'd already had several run-ins with the law before he encountered Officer Collins. He accepted a ride from some school friends when he was 15, only to be arrested with them soon afterwards when the police stopped the car. The friends had carjacked someone at knifepoint before picking Jameel up, but he went to prison anyway. Once out of jail, he was determined to straighten his life out and start his own business. Due to unpaid parking tickets, he was unable to drive, so he asked a friend of a relative if he could get a ride to the store to pick up some groceries before his infant son visited him for the first time. Before he went into the store, the driver asked to use Jameel's cell phone. When Jameel came out of the store, the was immediately arrested and taken to jail. The police believed he was a drug dealer named Ox and used the fact that drugs were found in the car as well as information on the cell phone to make their case. Of course Officer Collins was the main arresting officer, and when problems arose with his testimony (Ox was Jameel's cousin), he just changed his story to make it fit the facts. Jameel was once again convicted and sent to prison for a crime he had no knowledge of. Eventually, Officer Collins's misdeeds were found out and he was fired and also sent to prison. This caused many of the convictions he had secured to be overturned, including that of Jameel McGee. After both men were released from prison, they both ended up back in Benton Harbor, where their paths were bound to cross. The book outlines how they came to work together to help the less fortunate, and how they were both able to overcome their past problems and even become friends. It is an encouraging and uplifting story of how healing can take place even in the darkest of circumstances. There were some things that made me shake my head, though. For instance, poor Jameel just KEEPS getting sent to prison when he hasn't done anything. There are little asides throughout his story about further legal troubles that he doesn't really go into. Also? His trip to the store to get food for his infant son? He details his shopping list: milk, chips, pop and gummy worms. Um . . . that was the list of things he was presumably going to use to show his estranged girlfriend that he had food in the house for his baby. Andrew Collins also made the startling statement that if you're arrested on suspicion of having drugs in your car, any money you have on you and your vehicle can be seized and "even if the charges are dropped or you're found not guilty, you don't get your property back." How can that be legal? You can have things taken by the police for no reason? That didn't seem to make sense to me, either. I enjoyed reading how the two men were able to overcome their pasts and eventually become productive, helpful members of their communities (even if I remain skeptical as to all the details! ).